A 2003 Locus Recommended Reading List choice. Up Through an Empty House of Stars: Reviews and Essays 1980-2002 by David Langford assembles one hundred of his previously uncollected reviews and essays about science fiction, fantasy, and linked genres like crime fiction -- beginning with a long 1980 survey of G.K. Chesterton's speculative fiction (which quotes the source of this book's title) and ending with a 2002 appreciation of The Scar by China Miéville. See shameless blurb below. At last, Up Through an Empty House of Stars brings together the best of the never before collected SF reviews and articles that helped build David Langford's towering reputation since 1980. Complementing the review columns collected in The Complete Critical Assembly and the knockabout essays and squibs in The Silence of the Langford, this volume's 100 glittering selections mix serious critical insight with the inimitable Langford wit. In 2002 David Langford won his sixteenth Hugo award as Best Fan Writer, for critical and humorous commentary on SF. In the same year his occasionally scandalous SF newsletter Ansible won its fifth Hugo. Langford also received the 2001 Hugo for best short story, and the 2002 Skylark Award. Here he shines a unique light on classics like Ernest Bramah, G.K. Chesterton, Robert Heinlein and Jack Vance, and analyses major SF -- and major clunkers, and minor eccentrics -- of the 1980s, 1990s and early 2000s, continuing to the latest by such current stars as Gene Wolfe and China Miéville. Plus witty asides on crime fiction and its SF links, gleeful examination of writing so bad it's almost good, and (even at his most serious) turns of phrase to make you laugh aloud..
David Langford does an excellent job of convincing us that this stuff matters, and his latest collection of essays and reviews Up Through an Empty House of Stars provides an interesting complement to the Clute volume. * Langford, a sometime fiction writer, is better known for collecting an apparently endless string of Hugos as Best Fan Writer, an accomplishment which, whatever its merits on its own terms, may or may not be doing any good for his reputation as a professional critic of the field. The fact is, he's both fan and professional, as is more or less acknowledged by the reclassification of his long-running Ansible from the fanzine category into that ugliest of Hugo neologisms, the "semiprozine" (which sounds like a prescription tranquilizer, but which is actually a kind of belated admission that the SF world can no longer be neatly bifurcated into "fan" and "pro" camps). As with Clute, one approaches this collection less with an eye to chronicle-like coverage (Christine Brooke-Rose's oddball Xorandor is one of only two books reviewed from 1987, for example) than with an appreciation of Langford's sardonic and sometimes breezy commentary, which is often at its best when at its most querulous. His skeptical responses to Herbert's endless extension of the Dune series or Asimov's attempt to unite the "Robot" and "Foundation" novels are delightful, and reflect the suspicions of any intelligent reader of the period, while his excoriation of Heinlein's The Number of the Beast, only slightly moderated by a later review of Friday, is one of his most famous reviews to date. But even though Langford for the most part addresses a core audience of SF readers concerned with the state of the field, his best pieces often aren't reviews at all and often aren't about SF. The essays in which he seeks to revive interest in favorite authors such as Chesterton, Ernest Bramah, Rex Stout, or Anthony Boucher are model short overviews, and even though the only major contemporary SF writer to come in for such attention is Jack Vance, these are among the most fascinating pieces in the book, and among those that reveal most about Langford's real passions. On the other hand, the funniest pieces include his catalog of howlers and inconsistencies in mystery stories, and his brief but trenchant descriptions of SF gadgets and gimmicks that get out of hand. Langford is a consistently entertaining stylist who takes his material seriously, but not too seriously, and who after nearly three decades remains a valuable and eminently sane voice in the field. [...] The other thing about David Langford's writing is that as well as being well informed and perceptive it's also funny. Lots of people can do 'clever': read a few books, watch a bit of The History Channel and, hey presto, you know a few things that other people don't. It takes something a little bit extra to be able to write about a subject so as to interest other people in what you're saying. What Mr Langford can do, within the constraints of a review -- a form which straightaway stops him flying off at a tangent (well, nearly) because the whole point of any particular piece he's written is to synopsise, analyse and promote (or not) a specific piece of someone else's writing -- is simultaneously educate, inform and entertain, as Lord Reith once famously put it. Most reviewers should at least be able to inform; many can educate their readers too, but not so very many can entertain, and even fewer manage to balance all three at once in the Platonic ideal of Lord Reith. David Langford seems to have been doing this regularly for some time now. Langford, David. Up Through an Empty House of Stars: Reviews and Essays 1980-2002. Cosmos Books [PO Box 301, Holicong, PA 18928-0301, USA], ISBN 1-59224-055-0, 310pp, trade paperback, $21.95. (Sf/fantasy review collection, first edition; there is also a hardcover edition [not seen] priced at $34.95; this bumper volume complements Dave Langford's two earlier Critical Assembly collections, containing as it does about a hundred pieces first published widely in magazines, journals, fanzines and reference books; witty and insightful stuff, rightly commended on the cover by John Clute, Gregory Feeley and Lionel Fanthorpe -- essential Langford, highly recommended; Cosmos Books is an imprint of Wildside Press, a US print-on-demand publisher; to order, see the website: www.wildsidepress.com.) May 2003. Up Through an Empty House of Stars is a selection of David Langford's non-fiction writing from 1980-2002, most of the pieces not previously collected. The articles come from a variety of sources: Vector, SFX, The New York Review of SF, Interzone, Foundation, etc. I find it quite difficult to be entirely objective about the reviews and essays in this book. I was a teenager when I first came across Langford, when he was the book reviewer for White Dwarf magazine. He was the first reviewer I read who talked about the individual books in their own right rather than trying to fit them into some grand scheme of science fiction. The articles were witty and fun and made a fairly large contribution towards the development of my adult sf reading. However, UTaEHoS is a salutary reminder of an important fact about Langford that, in his role as the 'clown prince' of sf criticism, is often forgotten: he is incredibly well read both inside and outside the sf field. As several of the items show, Langford knows as much about detective fiction as he does about sf. He uses a review of a collected edition of Nero Wolfe novels as a springboard to discussing the merits of Rex Stout's creation and also discusses the more obscure Ernest Bramah. Perhaps of particular interest to Vector readers, there is also an introduction to a collection of Anthony Boucher's detective stories. On the sf side, there are a number of reviews, some familiar (his review of Heinlein's The Number of the Beast is perhaps one of his most well-known pieces), many less so. The reviews are of the normal high standard and manage to be both intelligent and entertaining. As an admirer of Gene Wolfe it is nice to have all of the Book of the Long Sun / Book of the Short Sun reviews finally collected together. A particular pleasure in this volume are some of the longer essays on the science fiction of G.K. Chesterton (1980), silly gadgets in science fiction (1992), and, perhaps the most impressive, an examination of the changing use of revenge motifs in the novels of Jack Vance. Also included are his introduction to the Science Fiction Foundation's Terry Pratchett: Guilty of Literature and an adapted version of the introduction to Maps: The Uncollected John Sladek, recent winner of the non-fiction BSFA Award. The only negative comment I have about the book is regarding the 'Original Appearance' index which lists the pieces in alphabetical order, rather than in the order they appear in the book which I would have found more helpful. I was not particularly taken with the rather 1970s-style orange cover either. Nitpicking aside, this is a fine volume which should find a place on any self-respecting sf fan's shelf. But I really do not need to tell Vector readers this, do I? YOU MAY KNOW DAVID LANGFORD AS A "MERE" SFX columnist. Up Through An Empty House Of Stars shows there's more to him than that. Sadly for us other SFX writers, you don't get to clock up more Hugo awards than Manchester United have league titles just by writing a monthly column in an SF magazine. Subtitled "Reviews And Essays 1980- 2002", this book brings together not just some of his SFX columns* -- don't worry, this is but a small fraction of the content -- but essays and reviews from a wide range of books and periodicals. And he displays (without showing off) his staggeringly wide- ranging knowledge of SF and beyond. After all, you don't get to work for five years as a weapons physicist at Britain's Atomic Weapons Research Establishment without having a decent number of brain cells. It's no surprise that SF greats Isaac Asimov, Robert Heinlein, Arthur C Clarke and Stephen Baxter join the roll-call of authors covered. More surprising are appearances by the "crime" novelists GK Chesterton, Rex Stout, even Ellery Queen, while the Rev Lionel Fanthorpe's prodigious number of obscure speed-written novels also get a mention. And though the book pulls together over two decades of Langford's non-fiction writing, the greatest emphasis is on the last five years. * Langford footnote: actually I avoided reprinting any of my regular, monthly columns for SFX (although I used a handful of book reviews written for that magazine), since with unsubtle cunning I plan to make another book of the first hundred-and-something SFX columns.... As for the stars at the end of the review, it's very gratifying to get four out of the maximum five! 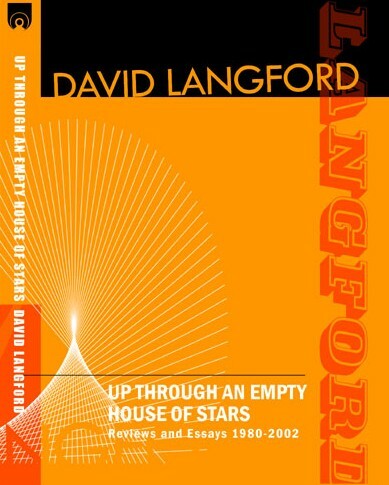 David Langford returns* in his Up Through an Empty House of Stars: Reviews and Essays 1980-2002 (Cosmos; paperback, $21.95). Trained as a physicist, Langford has been for years science fiction's chief critical gadfly, reading vast numbers of books and writing about them with authority, almost unimaginable zest and a lively blend of sass and sympathy. This latest collection offers several long essays on major figures like Gene Wolfe (emphasizing his Long Sun series), Terry Pratchett and the underappreciated John Sladek, but also several even longer essays on past masters, some in detective fiction: Cornell Woolrich, G.K. Chesterton, Rex Stout, Ernest Bramah (creator of Kai-Lung and the blind Max Carrados). A good and amusing introduction not only to the sf of the past 20 years but also to Langford's well-stocked mind. * "returns" -- this follows a review of Richard Bleiler's Supernatural Fiction Writers: Contemporary Fantasy and Horror, containing the sentence: "In most cases, a leading scholar of a particular author will summarize his or her thinking -- for instance, here are Henry Wessells on the idiosyncratic Avram Davidson, David Langford on Robert Holdstock, Brian Stableford on Russell Hoban, and Jeff VanderMeer on Alasdair Gray." Some statistics: I read this collection right through in one  go. I nodded sagely in agreement eighty-four  times. I shook my head in disagreement five  times. I laughed out loud forty four  times, and smiled or smirked scores [20s] of times more. I took off my hat once , at the end, in tribute to Langford's excellence as a critic. Actually, I'm making these figures up; but they give a ball-park sense of my response. This is a marvellous book. No reader of sf should miss it. Anybody interested in recent sf would do better reading the Complete Critical Assembly and Up Through An Empty House of Stars than any of the literary critical histories of the genre currently available. Go now; buy this book; read, laugh, and become wiser about SF.